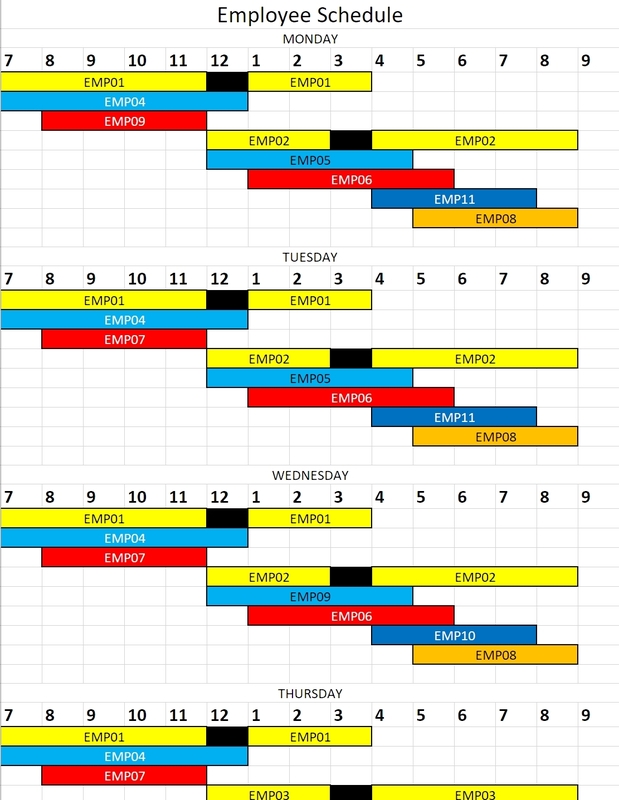 I have a drawn up a weekly schedule for imaginary employees who work at a store. Essentially I want to simulate as many weeks worth of clock-ins/outs as I can get in 1000 rows, using the schedule I have created. But I don't know how to generate that. Pretty much taking the hours they worked Monday-Sunday and copying it to every other week in the range of dates. Employees work the same hours each day of the week, and are off the same days each week, but they might not work the same hours on Monday, for example, as they do on Tuesday. But if they work 8-5 on one Monday, then they work 8-5 on EVERY Monday. Here's a screenshot of part of the schedule. Thank you for any insight provided. EDIT: I determined dateOut, was repetitive and unnecessary, so I removed it. The employees never work past midnight. I had a stroke of inspiration earlier and solved it myself using Ruby functions and the Row number in the id field. id % 10 gives 1 through 0 and then repeats every 10 rows.